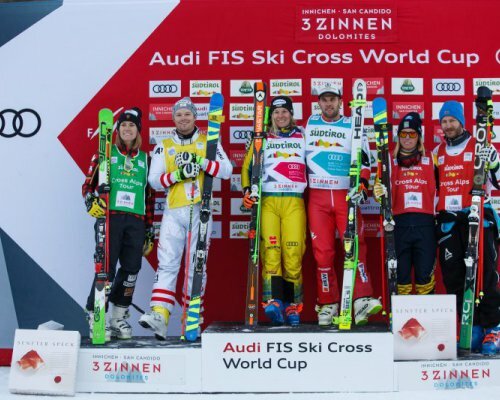 23.12.2017 - Innichen/San Candido (ITA) - After 15 days, 1000kms, five competitions, and 30 podium results, the winners of the 2017 Audi FIS Ski Cross Alps Tour were crowned on Friday afternoon in Innichen/San Candido (ITA), where the second straight day of thrilling ski cross action saw Sandra Naeslund (SWE) and Marc Bischofberger (SUI) claim poetic wins in both the day’s competition and the Tour titles. Beginning in Val Thorens (FRA) back on December 7, where the first event of the season was moved forward a day to compensate for the incoming heavy snowfall that would force the cancellation of the second schedule Val Thorens race, the Cross Alps Tour moved on to Arosa (SUI), where once again weather wreaked havoc on the program. After an aborted race there saw the qualification results stand in as final results, the Tour moved on to Montafon (AUT) where the weather would have stolen yet another competition had it not been for herculean effort by the organizers and a full buy-in from the athletes and trainers for what was likely the most abbreviated program ever seen at a ski cross World Cup competition. After a full competition program of training, elimination rounds, and finals got off in Montafon all in the span of a morning, it was on to Innichen for the final, where the weather was fine, the course was running fast, and the athletes of the ski cross World Cup were in premier form as they readied themselves to battle for a Cross Alps Tour title that was still anyone’s to win on both the men’s and ladies’ sides right up until the final competition. After making a crucial mistake in Thursday’s first Innichen competition that put her back to third place after leading the first half of the competition and dropped her back to second place on the Cross Alps Tour standing, Sweden’s Naesland was on a mission on Friday, absolutely dominating her first two heats on her way to the big final. Once there she would line up alongside Thursday’s second-place finisher Georgia Simmerling (CAN), Marielle Berger Sabbatel (FRA), and Fanny Smith (SUI), with Cross Alps Tour leader Heidi Zacher relegated to the small final. After Zacher won the small final with a world-class effort, it would be up to Naeslund to finish at least in second-place in order to take the Tour title, and do that she would, with relative ease, leading from start to finish in the final competition of the calendar year to take home the big trophy and the 5000 euro Tour bonus in the process. “I was sad for a while yesterday after the race,” sad Naeslund after the awards ceremony, “But then I started focusing on todays race, really looking forward to making today’s race better than yesterday’s. I felt really comfortable in the start today and I was able take the lead right away and the just focus on my skiing." Behind Naeslund was where the bulk of the action took place, as the Innichen track continued to serve up incredible passing right to the very end. While Smith would hold second through much of the track, a slick pass by Berger Sabbatel would drop her back to second, before Canada’s Simmerling swept quickly around the wide line through the final corner and outreach Smith at the line to take third. Naeslund finished the December Tour with 420 points, Zacher with 385, and Simmerling in third with 255. Over in the men’s competition, Bischofberger was riding high off of a exceptional win the previous day that had put the affable 26-yea-old into first place on the Cross Alps Tour standings before the grande finale. While Bischofberger’s road to Friday’s final was less straightforward than had been his front-to-back dominance on Thursday, it was still apparent throughout Friday’s heat that the Swiss skier had some of the fastest skis and best line judgment of anyone in the competition, and in a big final where he would face his teammate Alex Fiva (SUI), a pumped-up Viktor Andersson (SWE), and strong-skiing Terence Tchiknavorian (FRA), he would once again exercise those strengths. 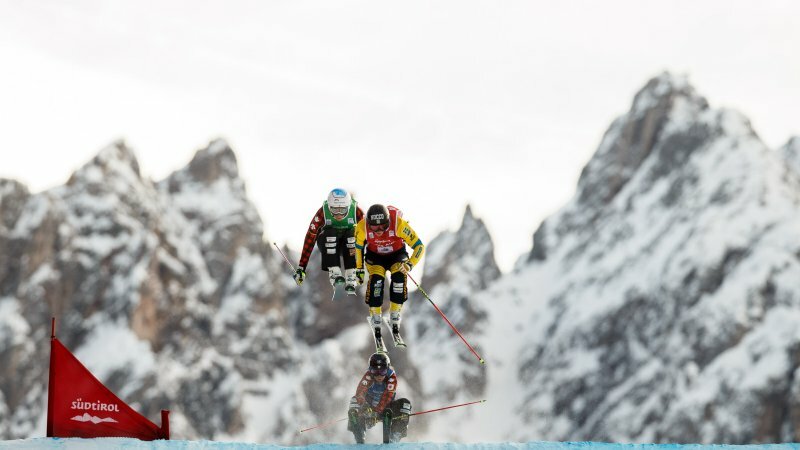 Starting from the skier’s left gate as he had through every heat of the two days of competition, Bischofberger once again leapt out of the gate and into a narrow lead through the first corner. Throughout the top half of the course there was barely a ski length between the four skiers, as each took turns taking a run at Bischofberger’s lead, with Tchiknavorian and Andersson jostling into one corner, only for it to be Tchiknavorian and Fiva bumping one turn later, with Tchiknavorian dropping in low line, plowing through a gate, and tumbling unhurt to the snow. From there, Bischofberger was able to walk away with the win, with Andersson sweeping down behind and into second for his second podium of the season, and Fiva taking third place for an incredible sixth podium at the venue where he got the first of his career seven years ago almost to the day. “From the start of the first race to now it’s been just perfect,” said a smiling Bischofberger, “I had many tough heats today. I had to pass, I had to fight, but at the end I’m again on the podium, two wins in a row and the Cross Alps Tour victory. There’s so many good skiers here, it’s so hard to get in front and stay in front and it’s just cool to race ski cross against them and amazing to win." The win gave Bischofberger a resounding win in a Cross Alps Tour overall race that had been incredibly close up until the final two races, with less than 100 points separating the top 20 skiers. However, by the time it was all over in Innichen, the man known as ‘Bischi’ to his friends had blown it open, finishing with 302 points to Tchiknavorian’s 218, with Andersson’s 211 points just behind in third. 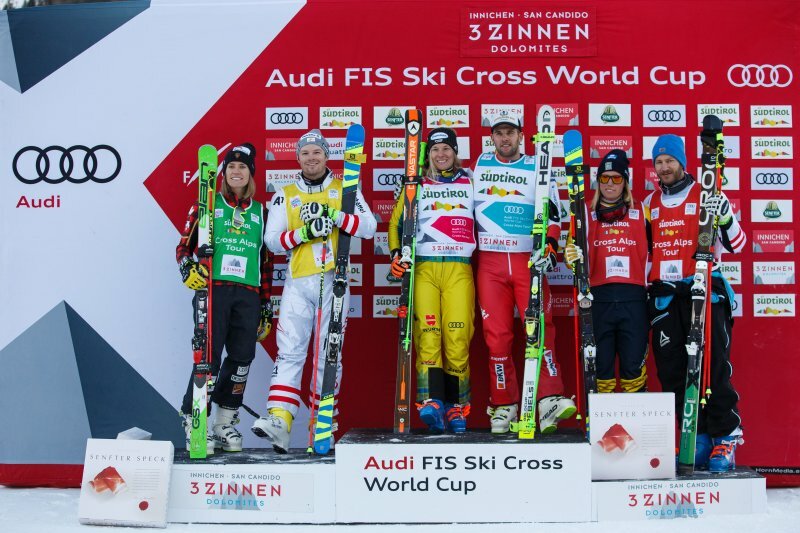 Despite the weather troubles, the second annual Cross Alps Tour was another resounding success, elevating the competition on Audi FIS Ski Cross World Cup from the word “Go” and giving an extra edge to every heat of every event. With the strategies employed in the public heat selections giving an insight into the competitive mind of the athletes, the test of will forced by the breakneck pace of the tour, the agony of the setbacks and the thrill of the triumphs all making for a memorable December. From here, the Audi FIS Ski Cross World Cup takes a much-needed break for the holidays before getting back to business at one of the highlight courses of the tour in Idre Fjall, Sweden, with back-to-back competitions slated for January 13 and 14th, 2018.